Few days back, I met a lady who though loves Indian cuisines does not know how to prepare them. While explaining to her some recipes of Indian curries, I frequently mentioned the word 'sautéing' and 'bhunao' which elicited a natural query from her whether or not bhunao is similar to sautéing. Now, as per my knowledge, bhunao and sauté both refer to the same technique of frying ingredients on high to medium heat in oil with small quantity of water added every now and then to prevent the ingredients from sticking to the bottom of the pan. The taste of Indian curries depends a lot on this bhunao as the spices and other taste boosting agents like onion, tomato and green chillies combine into a robust flavour through this process. But interestingly, when I did a bit of research on these two synonyms in our cyber world to get a broader perspective, sautéing was explained as a technique of searing or browning food on high heat. Not a mention of adding water or other ingredient like yogurt as preventive measure to hinder sticking was touched upon; whereas, bhunao was referred to as the same technique of frying food on high heat in oil with small amount of water or yogurt added to prevent over frying or burning of food. The literary definitions of the words made me realize that the word to word explanation of sautéing does not conform to our idea of the same in Indian cooking. Sautéing in Indian cooking is not limited to only searing or browning food, rather it's a rudimentary step to incorporate different flavours by frying the key ingredients like onion, tomato, ginger-garlic and spices with a repetitive addition of water in small measure to prevent burning, sticking or over frying. Sautéing creates the base of any Indian dish whereas sautéing as defined in wikihow refers only to stir-frying. Bhunao might be a better alternative for sautéing, but doubtful whether or not all the people are aware of Indian lingo, I usually adhere to 'sautéing' while explaining a cooking process. Assuming that the visitors of my blog are well aware of Indian sautéing technique, I give this discussion a rest here moving on to the recipe I am making this entry for. 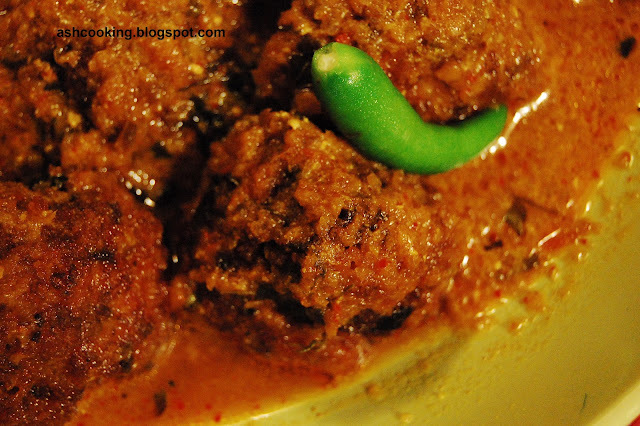 1) For the kofta, mix in all the ingredients and then shape them into balls slightly flattened between your palms. 2) Deep fry the koftas in smoking hot oil. Keep aside. 3) For the curry, grind onion, tomato and green chillies into smooth paste. Heat oil in a pan. When oil reaches a smoking point, add dry red chillies and bay leaf. Allow them to sputter. 4) Add the onion-tomato-green chilli paste. Fry till the water content from the mixture completely evaporates. Add ginger-garlic paste, kashmiri red mirch, turmeric powder, cumin powder and coriander powder. Sauté till the ingredients are well incorporated. 5) Add yogurt, 1 cup of water and salt. Stir properly to mix. Bring the gravy to a boil. 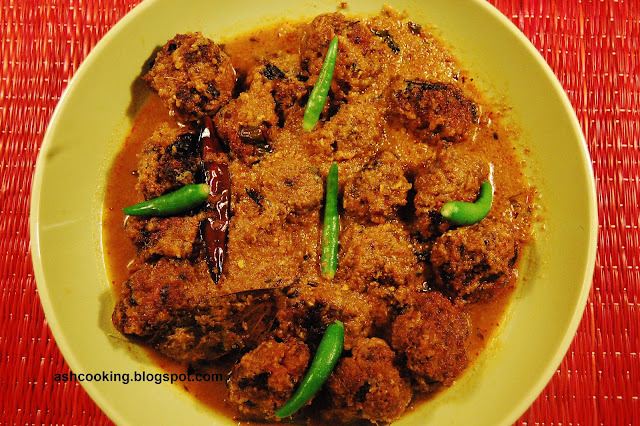 6) Toss in the koftas and keep simmering the gravy on low heat for couple of minutes. 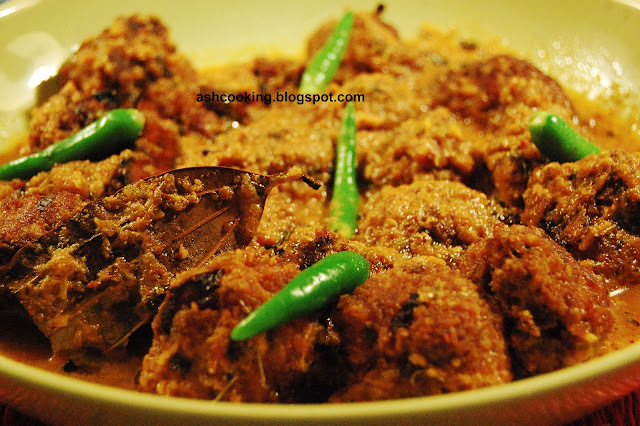 7) Sprinkle kasuri methi and turn off the heat. Keep the dish covered for 10 minutes before serving. 8) Garnish with green chillies or coriander leaves. Serve hot with rice.